To begin to understand the unique contributions to Argentine cinema made by the German émigrés Narcisa Hirsch and Marie Louise Alemann, it is instructive to consider each filmmaker’s life and work in terms of transitions and migrations. The most consequential passages in their personal trajectories led them, one as a child and the other as a young woman, from Germany to Argentina. Hirsch was born in Berlin in 1928 and arrived in Buenos Aires in the early 1930s; born in North Rhine-Westphalia in 1927, Alemann took a more circuitous route via Czechoslavakia, ending up in the Argentine capital by 1947. By the time both were married, Hirsch to a German mining executive and Alemann to a Swiss newspaper publisher and editor, it probably appeared, at least to the elites of Buenos Aires’ German “colony,” that each had elected to be defined primarily by the tripartite role of wife, mother, and socialite. Yet the decade of the 1960s was transformative for both women, marking the deepening of their shared investment in artistic practice. La Marabunta by Narcisa Hirsch, 1967. According to an autobiographical narrative Hirsch has repeated many times, she initially took up painting but subsequently abandoned it, influenced by the pronouncements of critic Jorge Romero Brest and the performance-based activities occurring at the di Tella Institute. 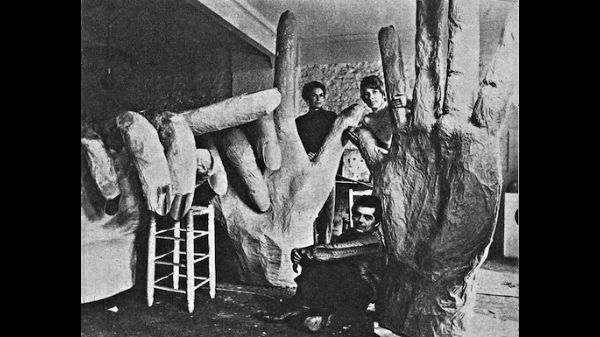 For a stretch of a few years in the late 1960s, Hirsch, working with Alemann and their Colombian friend Walter Mejía, concentrated on publicly-displayed gestures with open-ended meanings. 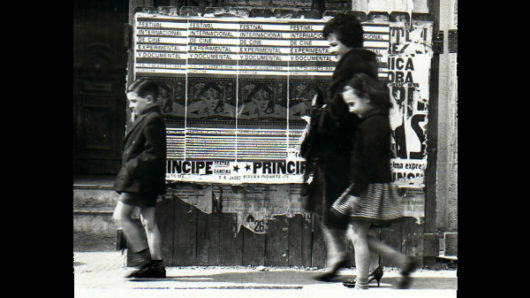 For her Operación color para la ciudad (Operation Color for the City) in 1968, she put up monochromatic orange posters (each signed “Color by Narcisa Hirsch”) in Buenos Aires’ microcentro zone. One journalist saw Hirsch as “providing aesthetic phenomena with a maximum level of purity, releasing them from all economic connotations – including that of a painting bought and sold – and in that way avoiding that they be transformed into one more product in the overwhelming torrent that spills over daily onto the shaken, blinded, narcotized consumers.” Other, more performative works of hers from the period also shared an apparent simplicity and were motivated by the impulse to provoke the benumbed or unobservant urbanite: Hirsch, Alemann, and Mejía carried three giant plaster hands through the streets, for another event they passed out free apples in an area densely populated by office workers, and Hirsch handed out small dolls of naked babies (repeating the phrase “Have a baby”) not only in Buenos Aires but also in New York and London. 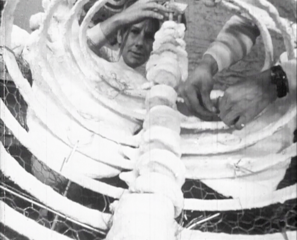 Most famously, for La Marabunta in 1967, the trio built a large skeleton of a woman out of plaster, stuffed it with live birds, finger food, fruits and vegetables, and displayed the sculpture as moviegoers were filing out of the local premiere of Antonioni’s Blow Up. That event (which, in interviews at the time, Hirsch resisted labeling a happening) was documented in 16mm, and Hirsch has often signaled its importance for her turn toward filmmaking. 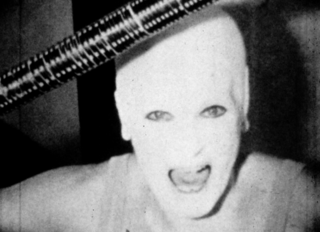 La Marabunta is also notable for bringing into proximity with the cinema a crucial element of her performance-based work, namely its attempts at converting a random assortment of strangers into a group of participants and spectators, at once observing and being observed, affecting the work and being affected by its arena of activity. 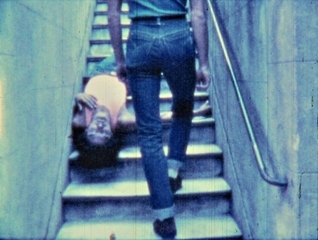 After using the performances to create and confront her own public, Hirsch would discover that the conventions of the experimental film screening held the promise of another kind of relationship between artist and audience, in encounters of a more direct and immediate nature than the norms of industrial movie exhibition would allow. Umbrales by Marie Louise Alemann, 1980. Before the cinematic output of Hirsch and Alemann became the mediating element in lively and heated exchanges between each filmmaker and her viewers, both women restricted the screening of their earliest films to private sessions among friends. Rather than conceive of her filmmaking practice in a hermetic manner, however, each filmmaker was able to regard her own work in relation to contemporary developments in arthouse and experimental cinemas, partly thanks to frequent travel, which took Hirsch to New York and London and Alemann (often as a journalist) to the Berlinale and beyond. In Buenos Aires, however, the initial audiences for their films, such as the fledgling filmmakers associated with UNCIPAR (Unión de Cineístas de Paso Reducido – the Union of Small Gauge Filmmakers), were hardly receptive, preferring home movies and conventional narrative efforts. To a degree, the interlopers rose to the occasion, in memorable scenes of discord that Horacio Vallereggio recreated for the opening of his film ¡UF! (1974). Alemann’s journalism, which focused on travel and the arts, rarely broached such issues, but in a suggestive review of Documenta 5 in 1972, which described works such as Edward Kienholz’s Five Car Stud (1969–72), she expressed her appreciation for those artistic “possibilities of confrontation” that could leave the petit-bourgeois spectator “deeply distressed and confused.” One especially vivid realization of this objective in Alemann’s filmography is Legitima Defensa (Self-Defense, 1980), whose eight-minute duration is entirely dominated by images of the filmmaker, shown wearing a bathing cap that makes her appear to be bald, contorting her face for the camera as growling is heard on the soundtrack, and wielding a wooden staff menacingly. Legitima Defensa by Marie Louise Alemann, 1980. This is a brief text, so I will only provide some general and introductory remarks about the films of Hirsch and Alemann. 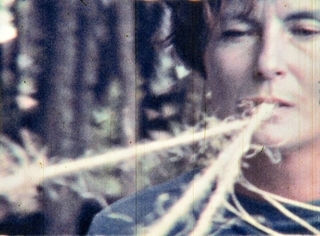 In the 1970s Hirsch often stressed that experimental cinema was, for her, closer to “music, painting, poetry” than “traditional cinema,” adding that it was also, importantly, “a very personal, very free way of filming, which does not entail a great expense, which is generally not story-driven. It tries to create sensations and moods.” Shot in the interior spaces of Hirsch’s everyday life in Buenos Aires, the plains and mountains of Patagonia, and on occasion more distant sites such as southern Spain, Hirsch’s cinema often foregrounds, through carefully constructed montage sequences and within a legato tempo, the representation of the body and corporeal experience. Among its many varied themes are the empowerment of women (Ama-Zona, 1983), the subject’s relation to place and landscape (Patagonia, 1972/73), ludic performance (Retrato de una artista como ser humano [Portrait of an Artist as Human Being], 1968), and mortality (Testamento y vida interior [Testament and interior life], 1976/77). 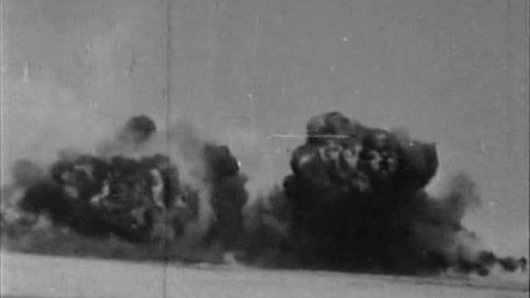 As the above quotation suggests, the short films Hirsch made between the late 1960s and the end of the 1980s are unified by some of the most widespread and readily identifiable motivating ideas within experimental cinema. Complementing Hirsch’s concern for sensations and moods is her search for psychologically resonant images and effects of visual immediacy, aspects of her filmmaking that coincided with Alemann’s practice. She also shared with Alemann an ability to move laterally across and within different realms of social and cultural life, and that mobility is reflected in the predominance of passages and journeys in Hirsch’s work. Testamento y vida interior by Narcisa Hirsch, 1976/77. Autobiografico by Marie Louise Alemann, 1974. Crucially for the development of experimental film in Argentina in the 1970s, Alemann used her contacts within Buenos Aires’ German circles to secure the Goethe-Institut as an institutional home for the films being made in Super 8 by her friends and acquaintances. 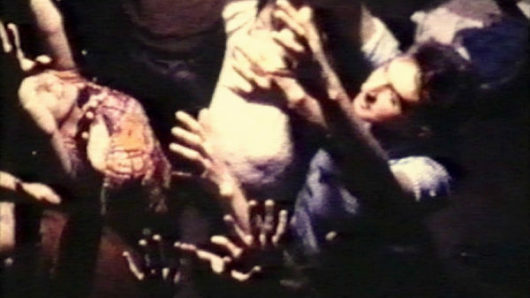 This was a key passage not merely for herself and Hirsch but for the “underground” community of experimental cinema in Buenos Aires as well: the move to a stable cultural institution was generative, for at least a few years, allowing for a recognizable set of practices and traditions – spanning the activities of making, showing, and debating experimental film – to coalesce around public events. The Goethe-Institut had enough funding to give away new Super 8 film, to host regular screenings and even a festival, and to offer workshops by local and foreign filmmakers, including Werner Nekes in 1980. That one of the most sustained efforts at promoting and exhibiting experimental film in Latin America occurred during years of intensified political repression in Argentina is remarkable. Yet the many different dimensions of that effort – including the many little-known films that were screened there – have scarcely been studied or analyzed in the prevailing literature. A final note: Marie Louise Alemann died in February of this year. I will be presenting a selection of her films at TIFF Bell Lightbox in Toronto on October 13 as part of its Free Screen series; at the London Film Festival on October 17; and at Cine Tonalá (along with films by Hirsch) in Mexico City in late October. As Hirsch understood the matter, the Argentine avant-garde of the mid- to late 1960s was responding in part to the death of painting, a polemic she associates, at least in the local context, with Romero Brest. For one version of this narrative, see my own interview with the filmmaker: “Narcisa Hirsch,” Cinematograph 7 (2013), a special issue also cited as Speaking Directly: Oral Histories of the Moving Image, especially pp. 50-52. “Sin ninguna intencion,” Análisis 403 (December 4, 1968), p. 46. Hirsch was hardly unique in taking her performances to the street. By 1968, a profile of Hirsch noted that “lately, in the streets of Buenos Aires, the actions of those addicted to communication have multiplied.” See “El jueves, si no llueve, la calle Florida conocerá el neo-happening,” Panorama (August 27, 1968), p. 60. Marie Louise Alemann, “Documenta,” Argentinisches Tageblatt (July 16, 1972). Moira Soto, “Narcisa Hirsch o cómo jugar con imágenes,” La Opinión (May 30, 1978), p. 4. In addition, Hirsch has made films closely linked to dominant tendencies in arthouse and commercial non-fiction filmmaking, such as the 1985 fictional narrative Ana, dónde estás? (Ana, Where Are You?) and the 1976 documentary on immigration titled Pioneros (Pioneers). Alberto Tabbia, “Las imágenes de lo desconocido,” La Opinión Cultural (August 19, 1979), p. 4. Exhibited at Galería Lirolay in the early 1960s, Alemann’s art photography was centered around portraiture, and her first film, Yo veo conejos (I See Rabbits, 1967), extends that interest into a series of portraits of herself and those who were closest to her at the time. A notable exception is Andrés Denegri, “El Grupo Goethe. Epicentro del cine experimental argentino,” Territorios audiovisuales: Cine, video, televisión, documental, instalación, nuevas tecnologías, paisajes mediáticos, eds. Jorge La Ferla and Sofía Reynal (Buenos Aires: Libraria Ediciones, 2012), pp. 86-103.